This guide provides tutorials for a variety of topics and in a several formats. If you have any questions or need help with your library research, please contact us. Learn how to search most of our databases and find the full-text of articles. Learn how to find scholarly theological articles and essays using the ATLA Religion Database. Learn how to use various tools such as lexicons, Bible translations, concordance, commentaries and more. 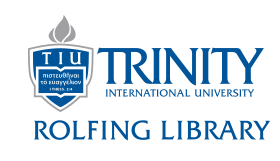 Learn how to find dissertations, theses, and projects at Trinity and other libraries. Learn how to use Trinity's PaperCut system to print and make copies. Learn how to find statistics in many different categories. Learn how to do Greek word studies by searching the TLG database. Learn how to find scholarly psychology and counseling articles and book chapters using the PsycINFO database. Learn how to access ebooks and articles as a distance student.